I’m in a love hate relationship with my computer, the internet and anything else electronic lately. I must have some weird electromagnetic charge running through my body that sends everything I touch haywire. Good grief. And what is up with all these updates, Java, Adobe, Windows, QuickTime… It’s all a little nuts. And can someone explain why Adobe loaded McAfee security on my computer while doing an update? But, like I said, it’s a love hate relationship. I do love my Google and reading my favorite Blogs. I like my SmugMug, except uploading large galleries, and I like reading what everyone is up to on FB. So, I guess we have to some bad with the good and hang on. This too shall pass until the next round of updates. Nice light, and I love the simple composition. Great isolating the branch - lovely contrast! Thank you for explaining to me why I have McAfee on my machine now:-) I did let Adobe update itself. One of those minuscule checkboxes I know to uncheck but never remember to uncheck until it's too late. Plug-In container keeps crashing on Firefox and then I have to reboot to get Firefox to restart. Life with computers is so great. Just totally agreeing with what you said. Misery loves company but truly sorry you find yourself fighting computer battles too. Oh, and before I forget, excellent comp and beautiful sky color to go along with it!!! 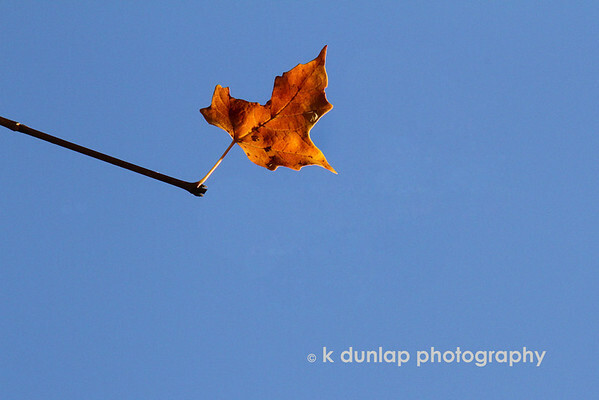 Nice capture and presentaion for a fall day and the changes we experience.